It's strange tracing the path I have followed with my jewelry supplies. I started out at Fire Mountain Gem and well basically picked up a bunch of pretty junk. Now mind you they do have some good stuff but I had NO idea what I was looking at. I then went into semi -precious gemmies such as rose quartz, amethyst, and my jaspers ( I freely admit that I love jasper for it's earthy color combos). Then I went to precious gemstones like sapphire and rubies and a lot of gem quality semi-precious. Such colors and shapes. Yeah you guessed it. 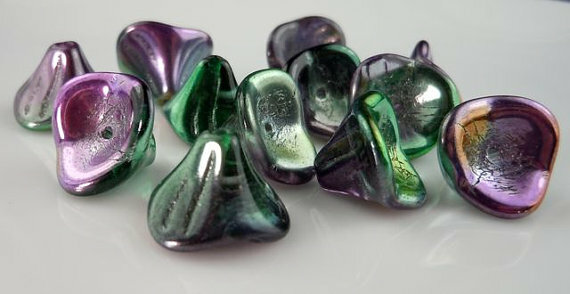 Czech glass. 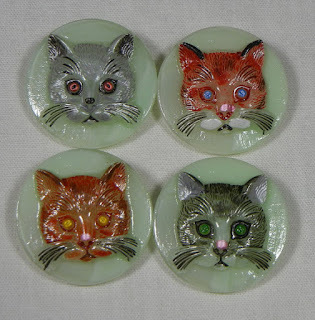 Oh and cruising about on Etsy just eying all the candy. Oh and if you fall in love with any of these beauties just click on the pic to arrive at your destination. 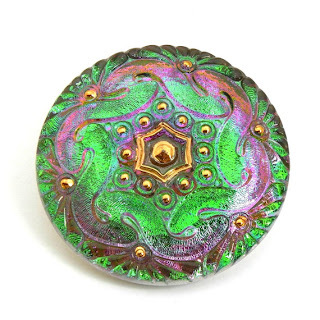 Now this one... well let's just say that I love green and purple together. I can just see these coming together in a bracelet. Ooops. I guess that I already did some Czech Glass I love their buttons. Looking for something with a feline theme? Now these colors are just delicious. 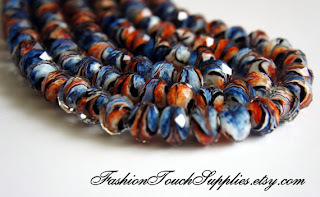 What was your path of bead addictions and what is your current one? Be sure to share as we might all find another love. I started off with seed beads and 'pretty junk' lol Then found my way into a beading haven with BSC ( before it hit fb and became bsc) and began to find my way into Czech Glass, various metals, and pearls.... and then a certain someone sent me some semi precious stones, and wham, I was hooked. ;) I love my semi-precious gemmies :)I still adore Czech glass, too..I think I always will, and some of it usually finds it's way into whatever I'm working on. Several years ago as I was starting out, I bought a bunch of gemstone beads, not knowing anything about them. I made a few things for about a year and then set them aside. Late last year I opened up my tackle boxes of beads, and I didn't know what anything was. Thank goodness I had little tags identifying many of the beads. I started selling gemstone beads in May this year. I've been reading a lot about them and handling different types. A couple of days ago I looked at a picture of a piece of jewelry and knew instantly that the bead was a tanzanite without ever having seen one in person. I was so proud. I'm still smitten by gemstones and wire wrapping. I haven't made enough jewelry to really evolve into my own style. 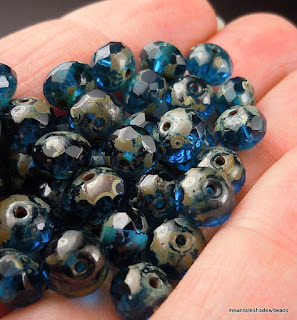 But I'd love to learn to solder, and I sure wouldn't mind getting my hands on something like these lampwork beads. Hi, my Name is Terri.... and I confess, I'm a Czech addict too. ;) Great post! I never met a bead I didn't like... or a gemstone. At least they're small!